A Madagascan lemur has been revealed as the first animal known to self-medicate when pregnant. Female sifaka eat plants rich in poisonous tannins in the weeks before giving birth, researchers have discovered. It is unclear why the sifaka does this. In other mammals, small doses of tannins kill parasites and stimulate milk production. And vets often use tannins to prevent miscarriage, raising the intriguing possibility that by eating the plants the sifaka is protecting its developing baby. At first sight, a taste for tannins might seem odd whether you are pregnant or not. Plants use them as defensive chemicals to deter herbivores from munching their leaves, as the toxic tannins bind to proteins in the animals' guts. "The sifakas are doing something that goes against the grain," says Michael Huffman, an expert in primate self-medication at Kyoto University in Japan and a member of the team. "But this probably means they have a good reason for doing it." His team studied Verreaux's sifakas (Propithecus verreauxi) in Kirindy Forest, western Madagascar. 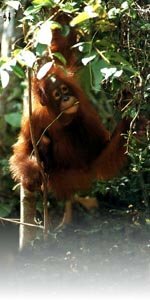 Pregnant females ate more of the tannin-rich plants, called fihamy and kily, than other females or males, the authors will report in a future issue of the journal Primates. They also found that the sifakas that ate the plants had fewer failed pregnancies than a group of sifakas that did not. Huffman accepts that he cannot be sure this is down to the tannins, as the sifakas that eat them might simply live in a less stressful habitat. Also, the researchers admit that the animals could be after other useful compounds in the plants. Numerous primates, including chimps, baboons, black lemurs and capuchins, dip into the jungle pharmacy to combat parasites. Some 39 species have been observed eating soil, which soaks up toxins in the gut and allows the animals to eat poisonous plants without getting sick. Another trick used by chimps is to swallow bristly leaves whole, which irritate their stomachs and induce diarrhoea, flushing out tapeworms and other gut parasites.